Nuremberg - Hamburger SV’s resurgence under new head coach Bert van Marwijk continued on Matchday 8, as the Red Shorts produced a stunning display to humiliate 1. FC Nürnberg 5-0 in the Bavarians’ own back yard. Spectacular goals from Rafael van der Vaart and Tolgay Arslan, as well as hat-trick from Pierre-Michel Lasogga that came within seven minutes and 21 seconds, gave HSV a deserved three points on the back of last week’s hard-fought 2-2 draw away at Eintracht Frankfurt, van Marwijk’s first game in charge. Four points from his first two games, both difficult trips away from home, have transformed the club in the last fortnight. 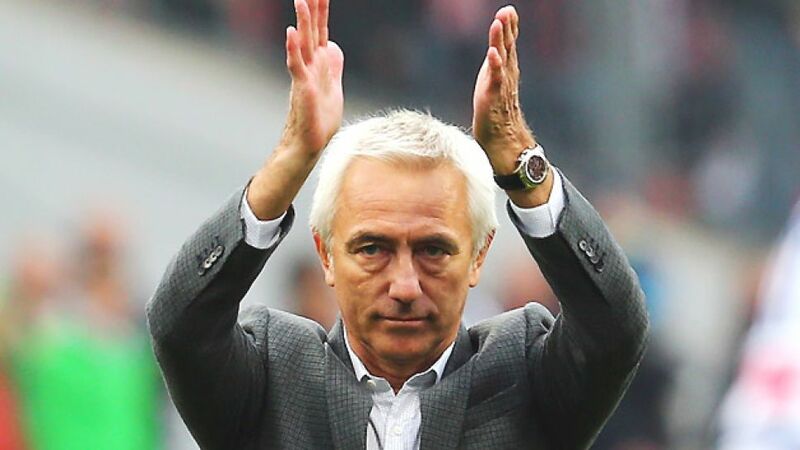 “I’m not here because of the city or the stadium,” van Marwijk had said at is unveiling. “I’m here because of the challenge. I’m the kind of person who doesn’t shy away from pressure.” The attitude that the 61-year-old has adopted from the beginning has been one of fearlessness and he has effected a change in mentality among the squad, something to which the players, already a talented bunch, have responded. Last week’s fightback against Frankfurt revealed a resilience in the team that had been lacking under previous coach Thorsten Fink, while the victory over Nürnberg owed as much to organisation and discipline as it did to individual class. “Of course I’m happy to score a hat-trick, but it’s more important that we functioned well as a team,” said a delighted Lasogga. One of van Marwijk’s ambitions had been to correct the team’s leaky defence and he seems to have found a way to do so. The experienced Johan Djourou, a summer loan signing from Arsenal FC, has now been paired with the youngster Jonathan Tah in the centre, with veteran Heiko Westermann moving to right back. Athletic striker Jacques Zoua was also used on the right side of midfield against der Club, meaning that the flanks, which had been the source of so many of the goals conceded by HSV, have been shored up. The return of Milan Badelj to the centre of midfield has also given the back four added protection. Although they came up against a fairly toothless Nürnberg attack, the clean sheet - only HSV’s second in the league since 10 March - will have done wonders for their confidence. The rout of Nürnberg also saw perhaps the best performance from HSV captain van der Vaart in many a Matchday. The 30-year-old was the lifeblood of the club in his first spell in Hamburg between 2005 and 2008 and the same is true since he returned in the summer of 2012, having netted nine times and assisted another 14 in that period. Two games, no defeats and the club’s most handsome league victory since November 2004: as Hamburg head into the international break, van der Vaart could well be right.